J-Boog, left, Raz-B, Omarion and Lil'Fizz appeal to both R&B and top 40 listeners. Uh-Huh, an upbeat R&B smash earlier in the year, is now making inroads at top 40 radio. Gots ta Be, a silky ballad, is picking up where Uh-Huh left off in R&B. The popularity of both songs has been fueled by heavy exposure on MTV and BET, and the Los Angeles group's live performances on last summer's tour with Bow Wow, the teenage rapper who recently dropped Lil' from his stage name. "It's really overwhelming," says lead singer Omarion (Omari Grandberry), 17. "We never thought that it would be like this." He says that though the ballad is about a special girl, the group which also includes Jarell "J-Boog" Houston, De'Mario "Raz-B" Thornton and Dreux "Lil' Fizz" Frederic, all 16 turned it into an ode to all of their fans when they made the video. Epic Records executive Max Gousse says the attention B2K is getting now is the product of a lot of groundwork put in by the label and group. "Usually in the R&B genre, baby acts don't get the support from companies to go around the country and really tour," says Gousse, who says the Bow Wow tour was key to creating a buzz. "But we made a commitment with B2K from Day One, because they were such a visual group, and we did everything we could to get them out there even before we went to radio." Along with the group's blend of R&B harmonies and hip-hop flavor (Lil' Fizz is the resident rapper), Gousse says B2K has a chemistry not seen since TLC. He says with the group's ability to attract different audiences, the record label has no problem pushing two singles at once. Omarion says the group members were well prepared for the mania surrounding them, having been schooled by members of the trio IMX (former teen stars themselves as Immature), also managed by B2K's manager, Chris Stokes. B2K's Raz-B is Stokes' nephew, while IMX's Marques "Batman" Houston is Omarion's half-brother and J-Boog's cousin. "They are like our mentors," Omarion says. "They help us with everything. They taught us how to be a unit and how to stay humble." Both groups are gearing up to hit the road in late <JU>July with Bow Wow on the Scream 2 Tour, which will feature Lil' Fizz's teen cousin Jhene as the opening act. "We can't wait for our big arena tour," Omarion says. "We rehearse five or six hours a day." The folks responsible for the Now That's What I Call Music! series are taking their next compilation LP to the street. Off the Hook, a hip-hop/R&B version of Now, is scheduled for release May 21, according to a Columbia Records spokesperson. Like the Now series, the LP is a collaborative effort between Sony Music, Universal Music Group, EMI and Jive Records. The album's 20 previously released tracks feature the smooth R&B of B2K, the soaring sultriness of Aaliyah and the aggressive bounce of Mystikal. The newest cut on the LP, "Feels Good" by Naughty By Nature featuring 3LW, comes from the rappers' next album, Iicons, due May 7 (see "Naughty By Nature, 3LW Save The Day In 'Feels Good' Video"). In this week's chart and sales analysis, we break down B2K's impressive debut by flashing back 10 years to the spring rise of another teen group. We'll also get remixed with Destiny's Child and Jennifer Lopez, and finish with a SoundScan-influenced prognostication at the NCAA tournament winner. Spring is upon us, and that means that the music industry is about to finally awaken from the winter slumber it annually succumbs to between Christmas and the Grammy Awards. In the coming weeks, a host of fresh albums and artists will descend upon the charts as the season for new music releases begins to come into bloom. While they weren't able to topple the "O Brother, Where Art Thou?" soundtrack on the new Billboard 200, some vernal-minded chart kudos go out to teen sensation B2K. 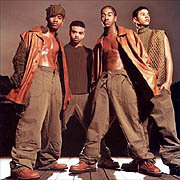 The Los Angeles quartet moved more than 108,000 copies of their self-titled debut to enter the albums chart at #2 (see " 'O Brother' Soundtrack Fends Off B2K To Hold #1 Slot"). Riding the success of their "Uh Huh" single and video, B2K have become the first new artist to have their debut LP crack the top five this year; up until the release of B2K, the top spots on the Billboard 200 had been dominated by some familiar chart vets, including Creed, Jennifer Lopez, Alanis Morissette, Brandy and the not-to-be-denied "O Brother, Where Art Thou?" soundtrack. Even though we're tempted to attribute B2K's impressive chart showing to the simple "out with the old, in with the new" spirit of spring cleaning, that would deny the common ground B2K shares with their musical forerunners such as New Edition and Boyz II Men, among others. That would also be denying both the Billboard chart and SoundScan history. What's particularly eyebrow-raising about B2K's #2 debut is that it comes almost precisely 10 years after another urban teen group, Kris Kross, made its infamous chart debut with Totally Krossed Out. B2K actually enjoyed the bigger debut over Totally Krossed Out in terms of both sales and chart positioning, as Kris Kross' first LP sold 75,000 copies out of the gates to enter the Billboard 200 at #9. Fronted by the duo of 13-year-olds Chris "Daddy Mack" Smith and Chris "Mack Daddy" Kelly and featuring the inescapable hit single "Jump," Totally Krossed Out immediately bounded up the Billboard albums chart following its release, reaching #1 for two weeks in May 1992 and logging 12 additional weeks at #2 throughout that summer. Totally Krossed Out went on to sell 4 million copies, although Kris Kross' other LPs would have as brief a chart life as Smith and Kelly's backwards fashion style. Issued in 1993, Kris Kross' second album, Da Bomb, was something of one selling just 700,000 copies, while the duo's final record, 1996's The Young, Rich & Dangerous, fared even worse by tallying 503,000 copies sold. Of course, there's another, more obvious connection between B2K and Kris Kross that helps complete the 10-year cycle between the two groups, and that would be the involvement of producer Jermaine Dupri. As a then-19-year-old, Dupri was the mastermind behind the Kris Kross phenomenon, writing and producing almost all of their material, including "Jump." Dupri has also been involved with the B2K album although on a much smaller scale as he lent his production skills to one of the LP's tracks, "Last Boyfriend." But B2K members Omarion, Raz-B, J-Boog and Lil' Fizz are probably more interested to know how their debut fared with that of another Dupri find, Lil' Bow Wow, whom B2K opened for while on tour last summer (in addition to appearing in Bow Wow's "Ghetto Girls" video). B2K should be happy to know that while Lil' Bow Wow's first record, Beware of Dog, didn't debut quite as well as their own, there is more than enough sales bite to Lil' Bow Wow's bark. Released in October 2000, Beware of Dog entered the Billboard 200 albums chart at #8 after selling more than 101,000 copies. While those numbers fall short of B2K's chart debut, Lil' Bow Wow has set quite a sales mark for his one-time tourmates, as Beware of Dog has sold 2.49 million copies to date. B2K may have bested the chart and sales debut of Lil' Bow Wow's first record, but the Lil' rapper still has much to woof it up about. Lil' Bow Wow has already achieved monstrous first-week returns for his second album, Doggy Bag, that B2K or any other teen urban act, for that matter will be hard pressed to match. Released the week before Christmas, Doggy Bag grossed over 319,000 copies its first week in stores to land at #11 on the Billboard 200. To date, Doggy Bag has wrapped up some 787,000 copies, and the LP is still holding on at #61 on the albums chart. If B2K and Lil' Bow Wow team up as planned for another joint tour this summer, look for them to compare notes and numbers during those late night, cross-country bus trips.